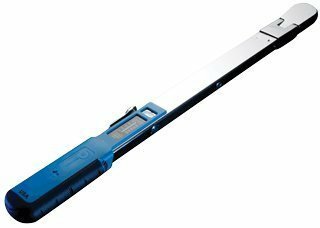 Are you looking for best torque wrench for money but can’t decide which square drive size and brand is suitable for your need? Fret not! In this article, we will guide you to get a perfect professional torque wrench for your repairing work. Firstly, it is important to know the required drive size and torque range before you buy a wrench. For instance, 100 ft-lb is average torque value for most lug nuts (also called wheel nuts) of cars but the exact value depends on the model of a car. Similarly, 1/2 inch drive torque wrench is good for most of the repairing work for cars, but some bolts need 3/8″ drive. There is 2 ways to know the exact torque value. You can either check your car manual (check the section for changing or replacing a spare tire) or if you lost your car manual, you can check the following links. 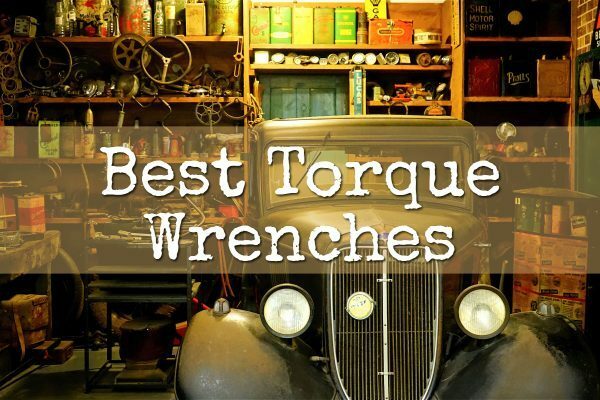 Once you are sure about the torque value, you can easily pick desired wrenches for your need. For example, if you have Honda Civic (1984-2016) then you need 80 ft-lb forces for tightening the nuts. Here are some of the best wrenches that are suitable for most of the repairing work like tire rotation, changing spark plug, cylinder head bolts and the like. After a lot of research, we can say that Tekton 24335 1/2 inch drive click torque wrench is the best one out there in the market. It is the best suitable torque wrench for tightening lug nut of the wheel for the most of car brands/models, its torque range is 10-150 ft-lb. Tekton 24320 1/4 inch drive click torque wrench is another best one because it comes with a for smaller bolt head. EPAuto 3/8 inch 10-80 foot pound stands in the list because it works best for other engine parts. Are you searching for a reliable, robust, and accurate torque wrench that won’t break the bank? Here are our top picks with detailed reviews. This Wrench will remain a perennial favorite since it continues to offer fantastic value. This kit comes with a 4-piece impact adapter and reducer set and is rated at 10 to 150 foot-pounds of torque. The 4-piece adapter set is made from premium-grade chrome vanadium steel and has a black oxide finish. The adapter and reducer set are equipped with spring-loaded detent balls that prevent them from dropping when locked into place. This is a great feature when working in tight spaces under the hood of your car or truck. 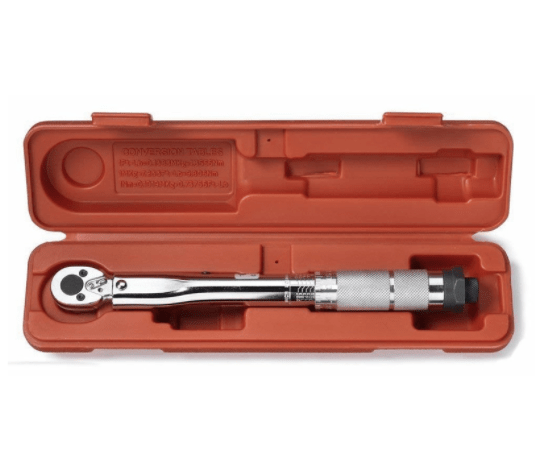 Why Should You Buy Tekton 24335 Torque Wrench? Like all the Tekton torque wrenches in this list, this ½” drive wrench is equipped with a high-contrast dual-range scale that makes it effortless to view the torque readings even in poorly lit working conditions. 1/2 inch drive and 10-150 ft-lb torque range is good enough for most of the mechanic’s works. 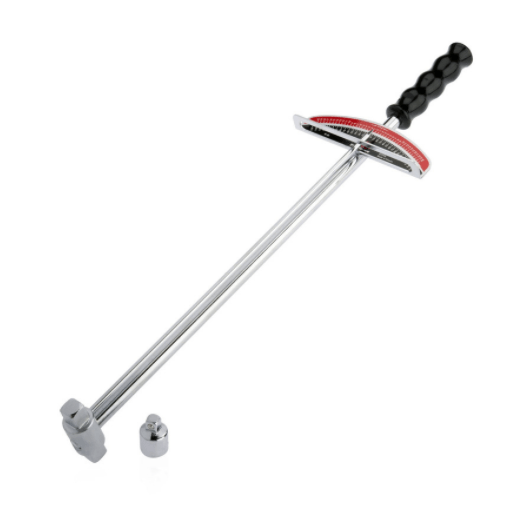 Spinning handle helps to set the desired torque you want to apply. Click type mechanism ensures an audible sound upon reaching preset torque. Not only do you hear click sound but also feel it in hands. Demarcated scale helps to read easily. It is marked in ft-lb (foot-pound) and NM (newton meter) on the opposite of the handle, half marked on the knurled handle and half on the metal body. Knurled handle scale is called micrometer scale and handle body scale referred to the main scale. The ratcheting head helps to continue works on bolt tightening without lifting it again and again. This could be used for removing fastener (not recommended by the manufacturer, only use the standard wrench for removing fasteners) but it cannot measure torque in the anti-clockwise direction. It measures in only clockwise direction. The wrench itself benefits from an all steel construction with no plastic parts. Tekton brand offers exchange warranty for broken or damaged tools. You don’t need to worry if you wrench is damaged. You can get a replacement by just contacting to manufacturer. It helps tighten the lug nut of your car and cylinder head bolt. It is perfect for cars and SUV’s tires rotation and swapping summer tires for winter tires. It is also used for installing power steering pump, changing time belt and lawn mowers blades. 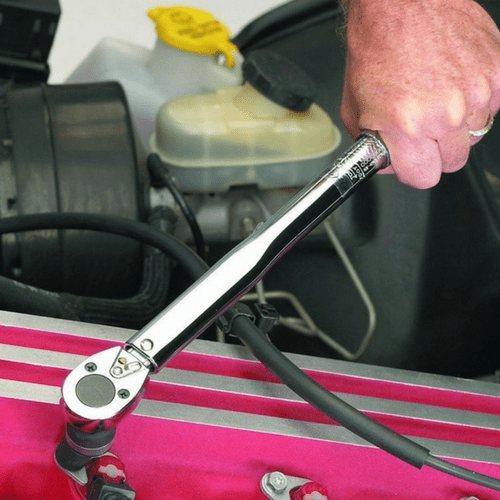 If all you want is a handy ¼” torque wrench for your motorcycle, bike, or small equipment, you need not look further than the Tekton ¼”.This is one of the best inch pound Torque Wrench. This tool is easy to use and comes with the same easy-to-read scale as the Tekton 1/2” model. The high-contrast dual-range scale is rated from 20 to 200 inch-pounds of torque and is easy to adjust. Similar to the Tekton 1/2” torque wrench, the smaller Tekton ¼” has the same all steel construction to deliver fantastic durability. There are no weak and brittle plastic parts so you can expect to use this torque wrench for a long time indeed. 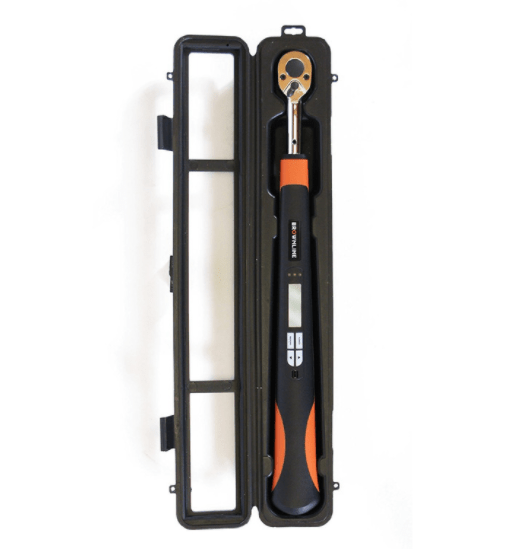 This ¼” torque wrench is accurate within +/- 4% and comes with a compact storage case. This kit is also equipped with a reversible ratchet head can drive in both directions. However, take note that it can only measure the torque in a clockwise direction. 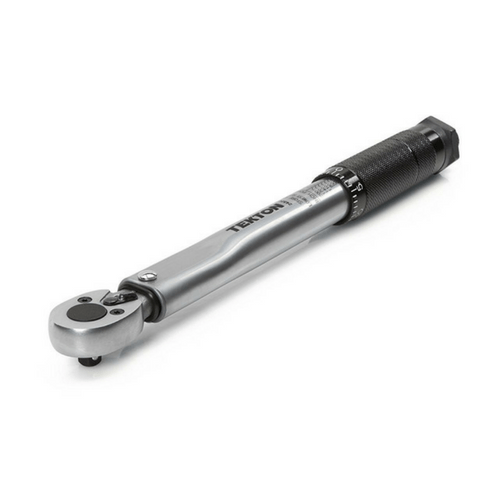 The good thing about the Tekton 3/8” Drive Click Torque Wrench is the high-contrast dual-range scale. This makes the torque values easy to read even when it’s a bit dark or gloomy. The torque range is 10 to 80 inch-pounds. This torque wrench is also calibrated to within +/- 4% to deliver faultless accuracy. When it comes to value, it is hard to fault the Pittsburgh Pro Reversible Click Type Torque Wrench. This kit is sold as a set of 3 torque wrenches in ¼”, 3/8”, and ½” sizes. You know what this means, right? If you’re a serious hobbyist and you need a complete set of torque wrenches for your car, truck, and bicycle, the Pittsburgh Pro should be on top of your list. Repairing is hard enough and it consumes a lot of time. Nobody likes to do it wrong the first time. The one who repairs knows that once something is done, it is done. Just Imagine! You use the wrong tool for some work and then you realize that you have made the work even worse. Think about it for a moment. I am sure the disappointment can break you into tears. Now you have to redo all the work you’ve just done. You could’ve saved yourself the time, effort, and extra cost of doing it right the first time. Using the proper procedures, and more importantly, using the right tool for the job can save you agonizing hours of redoing the finished work. Either you are a mechanic in the Automotive Industry or if your hobby is to maintain or repair your own vehicle, you need hand tools. You need tools like screwdrivers, wrench sets, Spanners, pliers, cutters, hammers and others and they must be the ones that are required for your work. Often mechanical and automotive jobs impose tight work areas, while precision and accuracy is also required. Despite years of experience, an expert mechanic can over-tighten or under-tighten a component which causes damage or breakage of vehicle parts. In these situations, we need tools which can work easily in these critical situations, provide accurate results, and alert the user to avoid over or under stress. 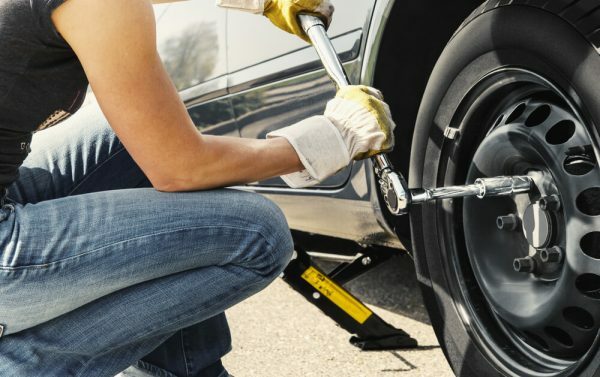 For tightening of lug nuts on cars, trucks and other large vehicles, a torque wrench is the best tool. 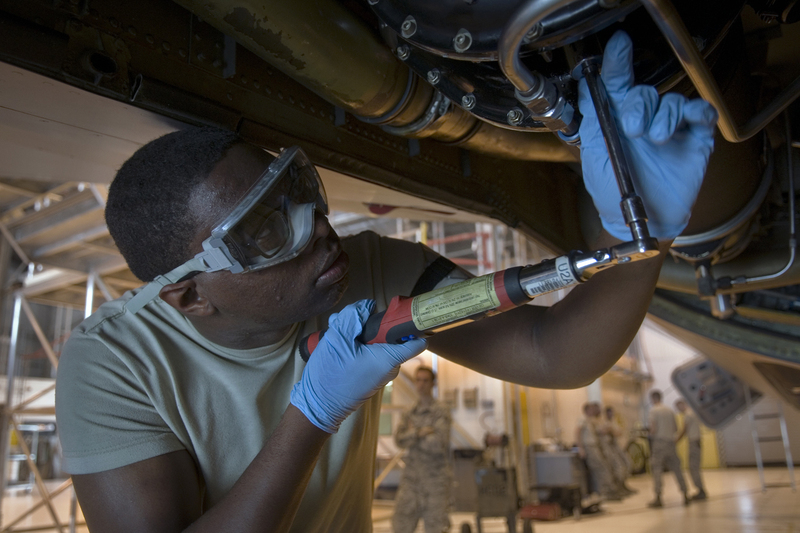 It applies proper force on fasteners to get the job done precisely. TW Sizes: Many users ask that What size torque wrench should I buy/use? 1/4 inch drive is used for very small nuts and bolts which require small amounts of torque such as Motorcycle, Bicycle, Lawn and Garden equipment. 3/8 inch drive is mainly used for passenger vehicles like Cars and Light Trucks. 1/2 inch drive torque wrenches are used for tightening lug nuts of Cars, Trucks, SUV’s, some large equipment and for larger automotive repairs. 1 inch drive torque wrenches are also available. They are used for heavy vehicles like Tractor-Trailers, Large Cargo Aircraft, Passenger Airlines and Marine works. What Exactly is a Torque Wrench?? It is an easy-to-use precision tool used to measure the accurate torque on a bolt, nut or other fastener. In other words, it is used to measure the amount of force applied on fasteners to meet the criteria set by the manufacturer. It helps the user to be efficient in tightening or loosening nuts, bolts, and screws while avoiding under-tightening and over-tightening them. When we apply a force to the nuts and bolts during the assembly of automobile parts, we use torque for clamping the parts together. For safety measures and for the longevity of fasteners, we need proper fastening tools that will precisely tighten to an exact specification. A torque wrench is a precision tool and measures the applied force/load/tension on the threaded fasteners during assembly. It helps to achieve the specific fastening torque quickly and correctly, yet operates smoothly with minimal human effort. A properly torqued fastener remains tight during the rigors of operation and vibrations that occur and can save the vehicle from any serious damages. Inadequate tightening or using poor torque fasteners can fail during operation due to high vibrations or strain. To avoid these problems, we need proper torque tools. With these problems in mind, engineers have designed torque wrenches to apply the specific amount of torque to joining the parts. Mostly, modern torque wrenches are equipped with a ratchet mechanism. It allows the user to keep the wrench on the fastener once it has reached the end of travel in the work space. The user simply turns the wrench in the opposite direction from its intended travel. The ratcheting mechanism uses a gear inside the wrench head to let the handle slip backward while the fastener remains still. It allows faster operation in a tight work space. Application: These wrenches are used in Automotive, heavy engineering, Aeronautic, Watercraft, Fertilizers and Defense Organizations, etc. Every brand’s torque wrench has the same operating principle, but accuracy, durability and prices are different. They are available in different sizes and lengths, and are sold in retail shops and online stores like Amazon. Before selecting or buying a torque wrench, we need to understand their features and select the best suitable tool according to our needs. When purchasing any torque wrench, there are a lot of questions of how to select the best torque wrench among the numerous sizes and brands available in the market. What size of square drive is needed? What is its operating torque range? Can it measure torque in both clockwise and counter-clockwise directions, or only one? What is the maximum torque it can measure? Is it easy to use and easy to grip during work? Is it easy to read the torque spec while tightening or loosening the fastener? Is its weight and length easy to handle? Does the manufacturer provide warranty? Does it include a Certificate of Calibration? Does it include a storage case? Does it meet ASME B107.14M-1094 and ISO 6789 standards? Is it manufactured with a locking feature? These wrenches are available with different sizes of square drive which have been previously explained in detail. Before choosing any wrench to buy, make sure the size of square drive matches the job you need to perform. Mostly torque wrenches have an accuracy of (+/-) 5%, which means a particular wrench should read within plus or minus 5% of the exact torque value. For Example, we set the value 15 newton meters (nm) on the torque wrench, and it should click constantly when the actual torque is between 14.7nm – 15.5nm. Mostly torque tools available on the market come with their own storage case. It is very important to have storage case for to maintain the accuracy and longevity of any tool, especially precision tools. Be sure to buy a case for your tool if it doesn’t come with one. Torque setting to which TQ wrench is calibrated. Units in either SI or in English. It heavily depends on your needs and your budget to determine the best torque wrench for you. TEKTON, NEIKO, GEARWRENCH, and CRAFTSMAN brands are good quality and have wrenches under $50 for the price-conscious shopper. If you are more concerned with owning high quality, long lasting tools, then you should buy CDI, NORBAR, and SNAP-ON. These brands have highly reliable tools with highly precise accuracy. The type of torque wrench most suited for automotive work is a clicker type torque wrench. It is the most popular and widely used torque wrench product in the world. It employs a clutch mechanism so that the clutch starts slipping once the required torque value is reached. It creates an audible click when it reaches the set value. It consists of two parallel rods: the wrench handle, and a second rod contains a needle or pointer which moves in both directions, clockwise and counter-clockwise by applying pressure. Using this style of wrench ensures accuracy. However, it may be a challenging task because you have to constantly look at the needle for an accurate reading. The “split beam” provides accurate reading and trouble-free performance. We can adjust it from the bottom of the scale to the top of the scale within seconds. It requires the least maintenance as the ratchet head is sealed. It has an easy grip handle and reduces user fatigue. The key benefit of this wrench is that you don’t have to release the torque after use. 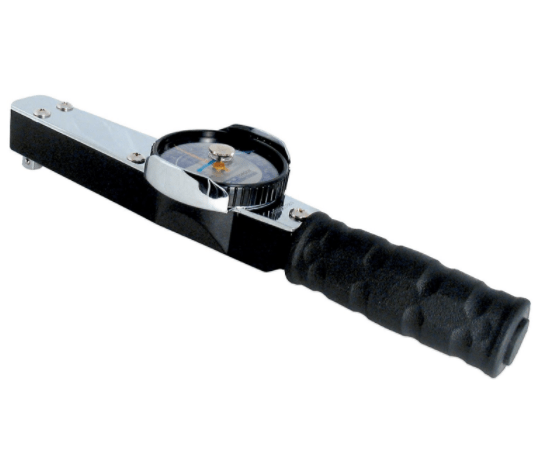 The design of this style of torque wrench and heavy metal guard makes it robust and durable. It uses a needle, which moves by applying force and shows the exact torque value. 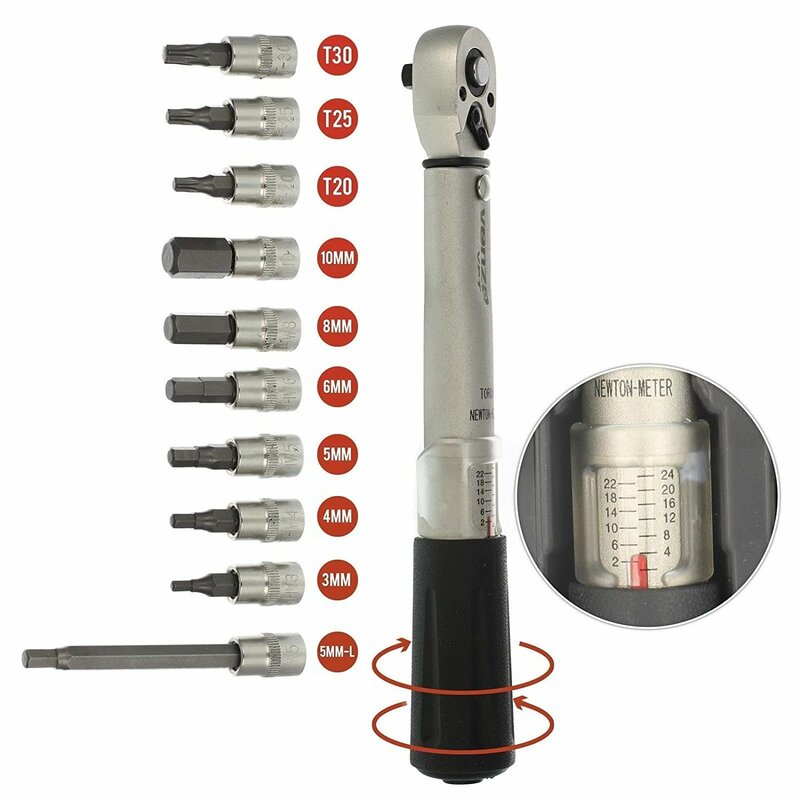 Mostly dial torque wrenches can measure torque in both clockwise and counterclockwise directions. According to some experts, dial type torque wrenches are more accurate than clicker type wrenches. It is the only wrench whose accuracy is not affected by hand-hold position. Usually it's dial face is large which makes it easier to watch the value and reduces human error. This is the most expensive, but also the most reliable torque wrench. It is most commonly used where angle plus torque is required. It uses of a large back-lit LED display for showing torque digitally to ensure that the users see the reading quickly and easily. It also includes a buzzer for audible noise and 3 different LED lights to alert the mechanics that the required value has been reached. These types of wrenches usually display all 4 types of units of torque: Inch-pounds, foot-pounds, Newton-meters, Kilogram-centimeter. The most advanced electronic torque wrenches have a feature that measures the tightening angle as well as torque. Its accuracy is unbeatable in both clockwise and counter-clockwise direction. Click here to find the best digital torque wrench for great quality and results. Finding the right torque wrench for you depends on your purpose. For bicycles, small engines, and precision repairs to small projects, a ¼ inch square drive is your best choice. 3/8 inch square drives are the best choice for automotive repairs, and ½ inch square drive torque wrenches are best for heavy mechanical, cars, trucks, SUVs, and large equipment. For any industrial projects or repairs, 1 inch square drive torque wrenches are your best choice. Learn from the mistakes others have made. Obtain the right torque wrench for the job at hand. You will save yourself the time and effort of redoing work a second time.